Site was down for a few days, should be OK now that I have my DNS in order. WordPress made a nice summary of my blog activity for 2011. It’s pretty much all Twisted, all the time. Then it goes on to suggest I should write more posts like that! I guess I should take the hint. Yang Xiaowei has translated a large portion of the Twisted Introduction into Chinese. Thank you, Yang! To those who have been waiting for a reply to posts on the Twisted Introduction, sorry for the long wait. My gmail spam filters suddenly turned extra aggressive recently, and my email notifications have been getting lost. Hopefully I’ve got this straightened out. Nina Evseenko has kindly translated the Twisted Introduction into Russian. The index page also has links to earlier translations into Japanese and Estonian by Shigeru Kitazaki and Tim Gluz respectively. 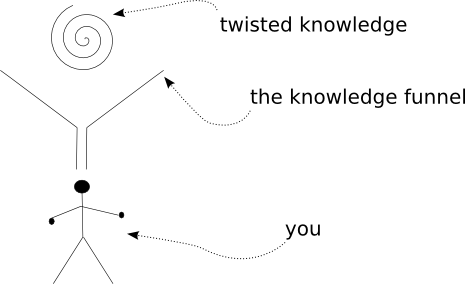 If you’re interested in a PDF version of the Twisted Introduction posts, there is now a joliprint link at the end of every post. I’m trying out this service, which creates a PDF from a web page on the fly. The results seem a bit mixed with the images, but maybe it’s useful.